Technological advancements have led to innovative designers incorporating immersive, interactive spaces into their designs. Stephanie Phillips takes a look at the world of immersive design, and asks will reality ever be the same again? Upside down sage mountain. Image courtesy of Meinert Hansen. Minority Report / Washington DC 2050. Design by Alex McDowell. Image courtesy of James Clyne. Death and the Powers - a Robot Opera. Composer, Tod Machover, design by Alex McDowell. Image courtesy of Jill Steinberg. 4D Creative develop immersive, interactive classrooms that utilise 4D technology. Image courtesy of 4D Creative. Children playing in their immersive classroom. Image courtesy of 4D Creative. Realtime Unreal - Museum of the Moving Image, New York 2011. Image courtesy of Immersive Design Studios - Thomas Soetens. 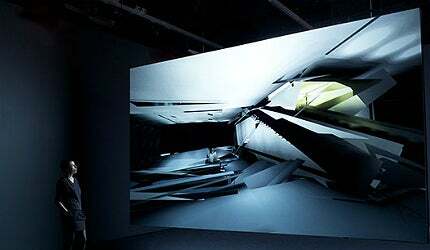 Hybrid Space and the Panoramic Screen - EMPAC, New York 2008. Image courtesy of Immersive design studios - Thomas Soetens. Architects and designers from all over the world are re-imagining what can be achieved in a small physical space with technology that opens up a virtual environment. Image courtesy of Immersive design studios - Thomas Soetens. Reality is a warped notion. Sometimes it’s easier to live outside of reality, and sometimes escaping the bonds of conventional rationality is just more fun. As technology advances, innovative, forward thinking designers from around the world are starting to incorporate new technology to create interactive, immersive new worlds. Immersive design is a relatively new term coined by Alex McDowell and his team at 5D in 2008, who describe themselves as a "global community of multidisciplinary creators that are fascinated by a shared pursuit of worldbuilding for the sake of generating new storytelling experiences." According to McDowell, production designer and creative director at 5D: "We were just searching for descriptions of what the experience of working with digital technology looks like. Worldbuilding is another attempt to talk about designing from space first. "Now, because of visual technology, you could start with a story idea, not a script, but a concept and build a world around that idea with the logic of that idea." Architects and designers from all over the world are re-imagining what can be achieved in a small physical space with technology that opens up a virtual environment. With the use of 4D and 5D technology, the extra dimensions being time and narrative, using interactive tracking capabilities and a bit of imagination, whole worlds can be created for the user to explore and develop. "Using interactive tracking capabilities and a bit of imagination, whole worlds can be created for the user to explore and develop." Worldbuilding is described as a new metaphor for the "design and iteration process, creating and actualising the story space in digital narrative media." An example of worldbuilding can be seen in McDowell’s project ‘New City’, which was a collaboration between McDowell, architect Greg Lynn and producer Peter Frankfurt. The project, shown at The Museum of Modern Art as part of the Design and the Elastic Mind exhibition, depicted a virtual, theoretical city made up of all the cities in the world floating in space and time. "You could imagine that New York is now a virtual city floating in space and Tokyo is on another virtual island floating in space and they can rotate relative to one another," says McDowell. "We developed that conceptually and then we developed 3D models and mapped a prototype for the exhibition so we could look at manifold shapes relative to one another, but the theory was that it was an opportunity to create new cultures." He continues: "If New York starts rotating and rubbing up against Tokyo, you’d have a new kind of cultural interchange and also in the virtual [world] that would start having a cultural effect on the real world, and at the same time the real world would be feeding data back into the virtual world. If the weather conditions change in New York, the colours of the buildings change in virtual New York." "Both McDowell and Soetens are keen to stress that immersive design and technology do not always go hand in hand." Projects that can be created through immersive design far surpass what designers could previously create with the tools available. The opportunities that are now available with these new tools could potentially broaden designers’ creativity. Thomas Soetens, artistic lead and founder at Immersive Design Studios, explains: "Today digital technology and connectivity have allowed us to rethink our position in the world and how we are communicating with people and organising our lives." McDowell says: "I think that there’s every opportunity that we can tell completely new stories because of it. I think if you start with the logic of a world and then immerse yourself in it, and design from that out, the ideas and the design and the story is being triggered by unexpected things that occur in that world. "It feels much closer to the way we think now to be able to design in digital space. I call it sculpting in space as you can mould an environment." Although the focus has been on the fascinating technology used in immersive design projects, both McDowell and Soetens are keen to stress that immersive design and technology do not always go hand in hand. "I’m not sure if we should connect the fact that we are now communicating this as immersive and that is only thankful to the efforts of technology," states Soetens. "I think in the history of art there has been many immersive projects that were developed that were potentially, completely without any use of technology." McDowell says: "I’ll come back to the idea again that the tools are not important. What matters is the way you think. I think you have to not weld yourself into any particular technology." A large proportion of immersive design works are built for user interaction and storytelling. This has led to the technology finding a home within the entertainment industry. In 2011, Korea unveiled its 4D Live Park, which allowed users to explore an immersive mixed reality where they could interact, play and change their stories through their 3D avatars. "The idea of non-linear entertainment stretches out to include books; the future of which McDowell believes is "unclear"." The upcoming Disney Avatar theme park will, according to Jim Hill, entertainment journalist at The Huffington Post, allow guests to "immerse themselves entirely in the world of James Cameron’s Avatar." Although the details of the project, which is set to open in late 2015, are kept tightly under wraps, Disney Research have released plans of their latest project Botanicus Interacticus, an interactive plant which glows when touched by the human hand. McDowell believes that immersive design will "massively" influence in the future. He says: "This idea of non linear is closer to the way that we think. The non linear, immersive design process enables different kinds of storytelling and I think that’s going to become addictive to the audience." Storytelling is an important aspect of immersive design and worldbuilding. Both McDowell and Soetens agree that no matter how advanced and interesting a concept they may have devised, the story must come first. Soetens said: "Your capabilities in virtual environments are that you can build much more interesting interactions in the narrative by taking full advantage of the non-linearity of the environment. "When we talk about narrative we may connect to what one would expect of storytelling, but in this case the storytelling would have to be something that is non linear and therefore needs to be thought out in a way that there’s no beginning and no end to the story." The idea of non-linear entertainment stretches out to include books; the future of which McDowell believes is "unclear". The next 5D event sets the task of deciphering whether there is any difference between a city and a book when set in an immersive space. McDowell says: "An interactive book becomes the opportunity for several authors to dive into that space and start affecting that story. We’re very conditioned to the idea that story is linear, but in reality authors are thinking about multiple stranded narratives that you could make a set of choices [with} as a user, in what we would have once have called a book, in the future and start travelling through a narrative space. "When you start thinking about a book in those terms then put alongside the experience of travelling through a city and developing narratives through a city, is there much difference between the two?" "Teachers can choose from 4D Creative’s library of curriculum based themes and even creative their own immersive experiences." Along with revolutionising entertainment, immersive design and 4D capable technology has been incorporated into the classroom. 4D Creative, based in Manchester, UK, develop immersive, interactive classrooms that utilise 4D technology to facilitate an experiential approach to education. Katie John, centre manager and e-learning co-ordinator, Witton Park CLC, told 4D Creative: "Students understand their objectives and own them. The space helps develop a wide range of skills, including investigative techniques, collaboration and time management"
Teachers can choose from 4D Creative’s library of curriculum based themes and even creative their own immersive experiences by uploading their own videos, pictures and audio. McDowell says: "I actually run a trans media design studio called 5D Organization, it’s a commercial spin off the non-profit 5D institute. We’re spending a lot of time thinking about the education space. "If you have the ability to create environments within which learning can happen, you can really start challenging the text book and the very linear teaching methodology that we’ve become used to over the centuries." The abundance of advanced technology in immersive design projects leads to an obvious question; can users still engage with an immersive project in the same way they would with traditional media? Both Soetens and McDowell believe that not only is user engagement possible, but that it is key to a successful, immersive project. "To make projects user-focused and centred, many designers refrain from making the user wear headsets or tracking gear." Soetens states: "You can’t develop a project around a cool technology or an innovative idea, it has to go and connect towards an audience. "In a sense what we’re doing with the design efforts that we have is really look at how the human is at the centre of this all and not just a user confronting an interface or confronting a learning curve to an over complicated project." To make projects user-focused and centred, many designers refrain from making the user wear headsets or tracking gear, preferring to implement interactive technology into the projects that moulds its output around the user. McDowell states that in our technology driven culture, immersive design is no longer a complex subject: "I think we’re getting past the point where technology is complex to use, it’s becoming more and more user friendly and I think it’s going to become more and more transparent." As technology develops immersive design projects will hopefully become less novel and more ingrained in our everyday lives. Currently most of the main narrative media fields are involved with immersive design in some way. Immersive design and 4D / 5D technology has only just begun its journey and this certainly won’t be the last we hear of the technology. On the future of immersive design McDowell is balanced, stating: "I think the great thing about that is that we have no idea. It would be foolish for anyone to say that they knew what the future looked like." Could nature become as big an inspiration for construction materials and design techniques as it has been in other fields? The Art Gallery of Alberta is immediately recognisable for its winding 190-metre stainless steel wave, a masterpiece of geometry inspired by unique local traditions and the ephemeral Aurora Borealis. For some, a demurely decorated room just isn’t enough. From hotels in space to 21st century beach huts and underwater hotels, Stephanie Phillips profiles some of the weirdest interior design concepts known to man. On design-build projects beset by complications and economic uncertainty, software can be a help or a hindrance.